I realize that I might be accused of being a decade too late for this discussion, but looking back at 1995, the Star Trek writers did a truly phenomenal job of painting a flawless portrait of our first female captain, (Elizabeth) Kathryn Janeway. In my teens, I’d skipped the Star Trek Voyager series entirely. I took the attitude, as devoted TNG Trekkie, that nothing could ever be like The Next Generation, so why bother? Now, at age 2*, as I finally embark on a journey of self-discovery and feminist theory, I find that I am eager to discover strong, female role models to admire. Loneliness frequently haunts my voyage and sometimes the weight of despair about the state of our world and its ingrained sexism engulfs me. But if I can find evidence of egalitarianism and show proof that sexism needn’t be present in all fictional depictions of women, it becomes easier to revitalize my hope and faith in a positive future. 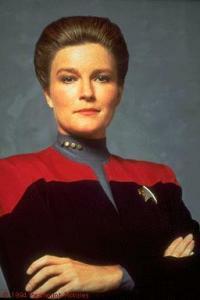 Janeway very much revitalizes my optimism. I’ve watched the complete first season (I’m partway through Season 2) and I am utterly satisfied that her character was invented and executed with incomparable equity and sensitivity. She conducts herself professionally while retaining charm and personality. Her mind – and wit – is sharp at all times. She exudes strength and perseveres heartily through adversity. The other characters relate to her in a respectful manner (or else they learn to do so in short order) and she even has a sense of humor. Neither too harsh nor too soft, she stands up for herself and others when injustice or disrespect rears its head. She speaks for those who have lesser voices and maintains high standards of personal integrity. and much more… but these things haven’t surfaced. And as I continue my journey into the great unknown, I am comforted with Janeway by my side. If she can do it, maybe all of us can.